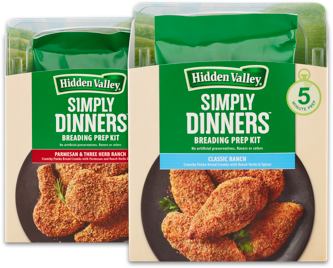 Simply Dinners™ breading prep kits come with two easy-cleanup trays, plus a delicious panko + ranch seasoning combo. Just dip, coat, bake for a super-cinch weekday dinner with no artificial junk (meaning, no artificial preservatives or flavors). Comes in Classic Ranch and Parmesan & Three Herb Ranch flavors.